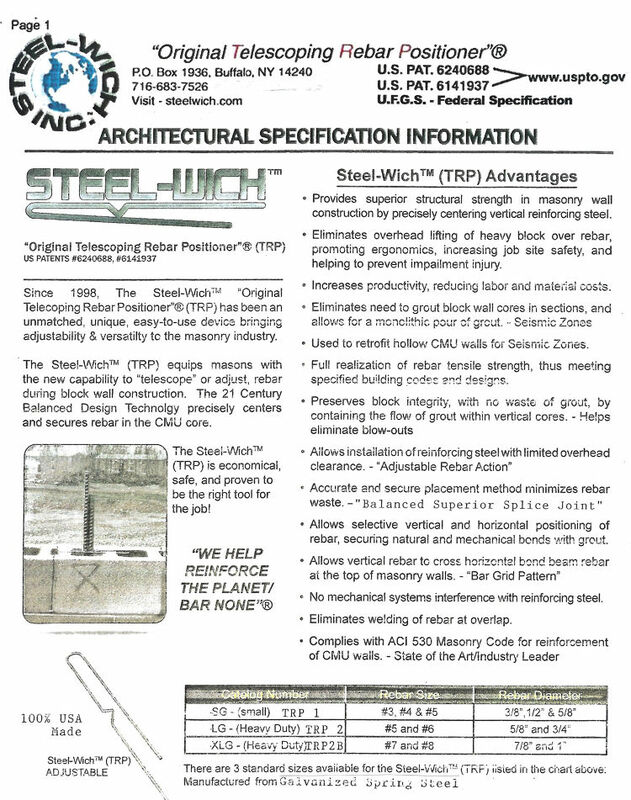 Steel-wich | "Original Telescoping Rebar Positioner"
STEEL-WICH™ CMU Telescoping Rebar Positioner™. Patent No. 6,141,937 and 6,240,688. This new unique device holds and precisely centers rebar in a block core. The unique STEEL-WICH™ CMU Telescoping Rebar Positioner allows for unlimited vertical movement of the rebar during block wall installation! The “STEEL-WICH™ METHOD”: Using the CMU Adjustable Rebar Holder, the mason acquires a new capability to “Telescope” rebar during placement. This allows reinforcing steel to be installed with ease, in area of a masonry wall, which was difficult, if not impossible to do before. 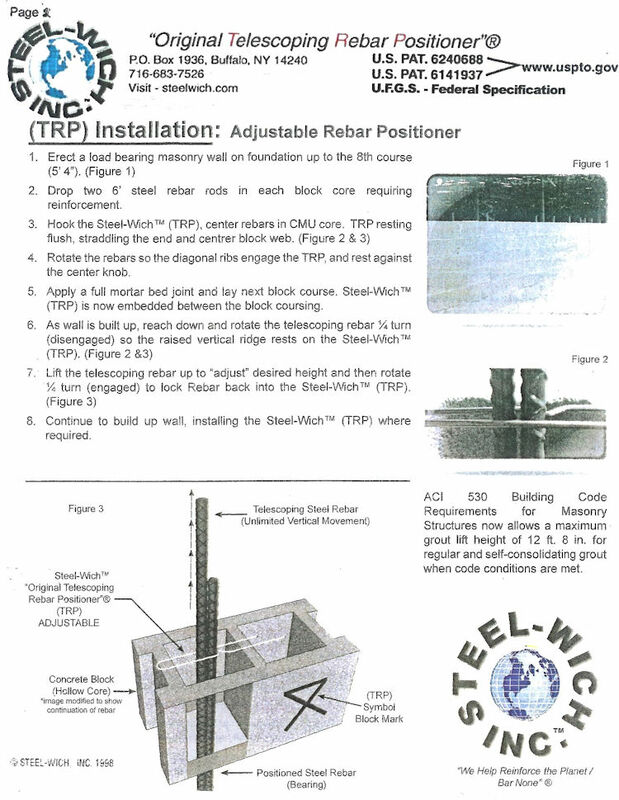 Steel-Wich Telescoping Rebar Positioner is the state-of-art masonry device used and Federally specified in current masonry construction to maximize building strength and efficiency while minimizing construction related injuries. 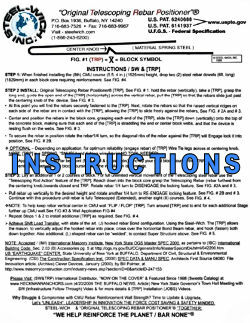 Click Here To Download The Spec Sheet to view the Army Corps building specification established in 2010. See New York State OGS Master Spec established 2000 for (IBC) International Building Code. Increases a Mason’s Productivity and Reduces Labor costs, with NO overrun costs whatsoever! No Overhead lifting of heavy block over Rebar, “No Rebar in your face”! Ability to install reinforcing steel with limited overhead clearance through the use of “Telescoping Rod Action”. Eliminates Rebar Waste, by accurate and secure placement method. Provides superior structural strength in masonry wall construction by precise location of vertical reinforcing steel. Full tensile strength of rebar may be realized, thus meeting specified building codes and designs. Eliminates the need to grout block wall cores in sections and allows for a monolithic pour of grout. Block integrity preserved, no waste of grout, controls the flow of grout, and provides containment within the vertical core. Selective vertical and horizontal positioning of rebar possible, ensuring natural and mechanical bonds with grout. 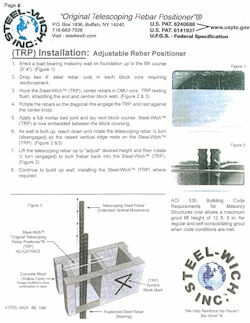 Allows vertical Rebar to “cross” horizontal bond beam rebar at the top of masonry walls. No problems with mechanical systems interfering with reinforcing steel. Customize Rebar reinforcement on every job, without the extra cost. 7/8″ 22 mm) and 1″ (25 mm) reinforcement rods. Available Plain Steel or Electro Plated. 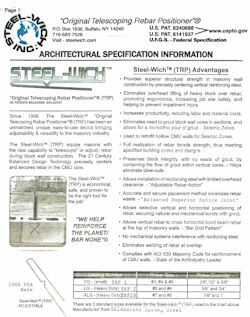 Since 1998, Steel-wich has reduce the total number of required Dated Rebar Locators (Per Job) BY UP TO 75%! When your not using (High Lift Grout) Steel-wich’s TPRs, you are spending too much money, using too much materials and spending too much time on every job! Below is a CMU Reinforced Wall Usage Chart. Contact Us If You Have Any Questions.